IT’S MORE EXPENSIVE to live along the Luas Green Line in Dublin – but you’re more likely to get a discount on a house’s price along the Red Line. The Daft.ie Rail Report, released this morning, crunches the numbers from almost a million listings from between 2006 and 2014. It found an average 6% house price premium for properties close to DART and Luas stations in the capital. The Green Line, running south from Stephen’s Green through some of the city’s wealthiest suburbs has the biggest impact on prices. The report looked at properties within 2.5km of the DART rail system and the two Luas lines. According to economist Ronan Lyons, who compiled the research, it was found that “when looking at individual homes, there is clear evidence from the DART and Luas lines that being close to train stations gives a benefit that is reflected in prices and rents”. The impact was up to 10% for properties close enough – but not too close – to stations. “The effect differs by area – with a premium for homes near Luas Green stations but a discount near Luas Red stations. Not only that, there are important differences between the price effect and the rent effect – particularly for the Luas Red line. The Cherrywood extension to the Luas Green Line in south Dublin, completed in 2010, boosted prices by over 10% and rents by up to 5% once it opened. However, the extension of the Red Line to Saggart in the southwest of the county appears to have actually had a depressing effect on house prices there. Luas Green Line stations have a positive impact on prices and rents nearby – with some evidence of ‘congestion effects’ very close to stops, making those areas slightly less desirable. Luas Red Line stations, meanwhile, had a positive impact on rents but not on prices – suggesting the area around the station is also important. There was a clear positive effect on properties near DART stations – in both the sales and rental sectors. Houses and apartments near DART stations command prices of roughly 8% more than those over 2.5km away. In the rental market, the premium is smaller (between 1% and 4%) and ends sooner (at 1.5%). An “anticipation effect” was also observed – with house prices rising during construction of rail projects by around 5%. For instance, there was an increase in prices along the proposed route of the Metro North line, which was later mothballed. “There is evidence from Daft.ie sales listings that, at the end of the Celtic Tiger, when the Metro North was announced, it boosted the price of homes near stations by 8%. As the chances of the Metro being built faded with the economic crisis, this turned into a significant discount of 20% by 2010. Work is currently ongoing in the capital on the Cross City line. The €368 million project will link the existing Red and Green lines in the city centre, connecting Cabra in northwest Dublin to St Stephen’s Green, via O’Connell Street. 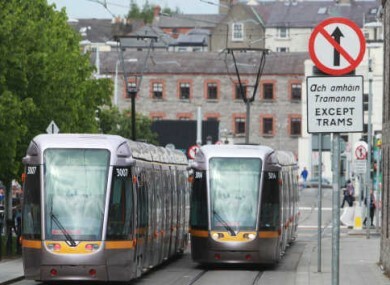 Email “The Luas effect: People pay more to live close (but not too close) to a tram stop”. Feedback on “The Luas effect: People pay more to live close (but not too close) to a tram stop”.